Christmas Dinner MenuChristmas party catering fit for a King, with turkey & all the trimmings! Christmas with Patricia is made up of lots of lovely delicious homemade foods and Christmassy table decorations. Choose from our Christmas dinner menu with lots of choices and also our added decoration package. The Christmas dinner comes with all staffing, cutlery, crockery and all necessary condiments. Please call Patricia for any help or advice required to make your Christmas celebrations special. A three course Christmas Dinner at £29.50 per head and a two course Christmas Dinner priced at £24.50 per head. Get into the Christmas Party mood by adding Christmas crackers, serviettes, party blowers, party poppers and a Christmas decoration for the centre of each table centre for £1.25 per head. Christmas with Patricia is made up of lots of lovely delicious homemade foods and Christmassy table decorations. Christmas catering prices are based on 40 people and above; pro rata costings apply to lower numbers. Choose from our Christmas dinner menu with lots of choices and also our added decoration package. The Christmas dinner comes with all staffing, cutlery, crockery and all necessary condiments. Don't leave it too late to book your Christmas party catering! 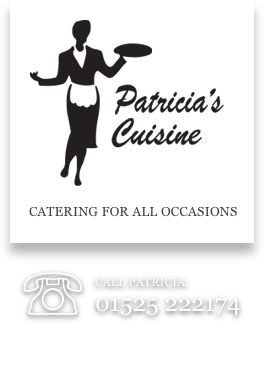 Please call Patricia for any help or advice required to make your Christmas celebrations special.